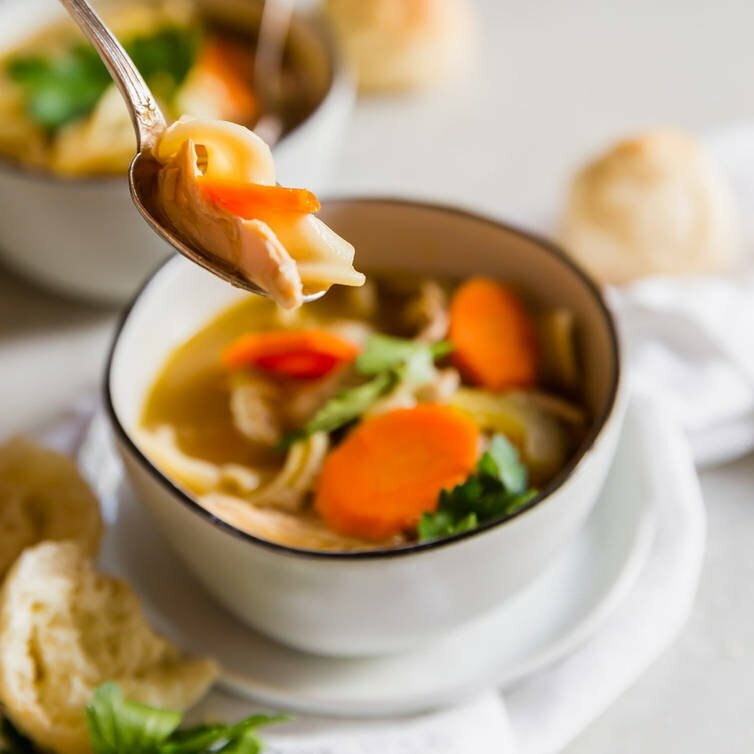 This classic homemade Chicken Noodle Soup recipe is made from scratch with chicken, vegetables, broth and noodles, and is ready in under an hour. Use a store-bought rotisserie chicken to save even more time! I’m not sure what it’s like in your neck of the woods, but we’re still hanging on to winter here. Snow, ice, and cold temperatures are still showing up on a regular basis despite Mother Nature giving us glimpses of spring with a spattering of sunny days in the 50’s. 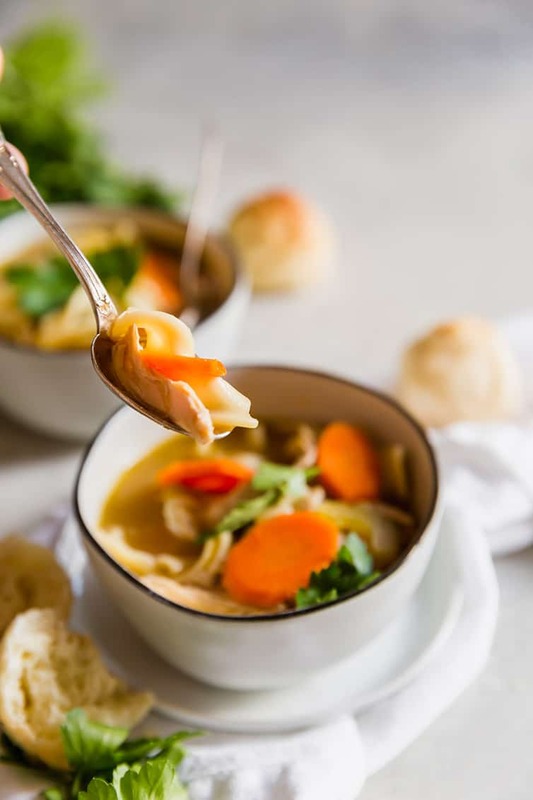 If the weather is still cool where you live and/or you’re dealing with any sniffles, that means one thing: it’s time to keep the good ol’ standby, chicken noodle soup, at the ready in the refrigerator. 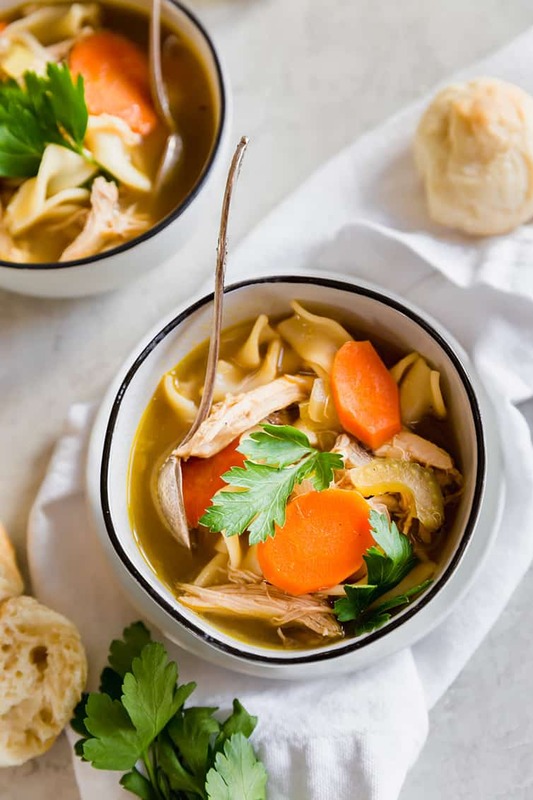 If you are coming in from outside or keeping yourself wrapped in blankets, nothing seems to hit the spot quite like a piping hot bowl of chicken noodle soup. The great news is that this amazing bowl of soup couldn’t be easier to make and you can have it ready in less than an hour. Onion, Celery & Carrot – This is a classic trio that works as a base for many soup recipes, and for good reason! Known as mirepoix, this combination is sautéed to lock in rich and robust flavor from the ground up. Chicken Stock – If you keep homemade chicken stock in the freezer, you can absolutely use that in this recipe. If you’ve wondered the difference between stock and broth, traditionally broth is made from the meat parts of the chicken, while stock is made from the bones. Stock has a richer flavor thanks to the gelatin that’s released when the bones are simmered for a long amount of time. Chicken Breast Meat – What’s chicken noodle soup without the chicken?! You can cook and shred your own chicken, or you can pick up a rotisserie chicken from the grocery store to make this an incredibly easy and quick weeknight meal. You can also add in dark meat if you’d like! 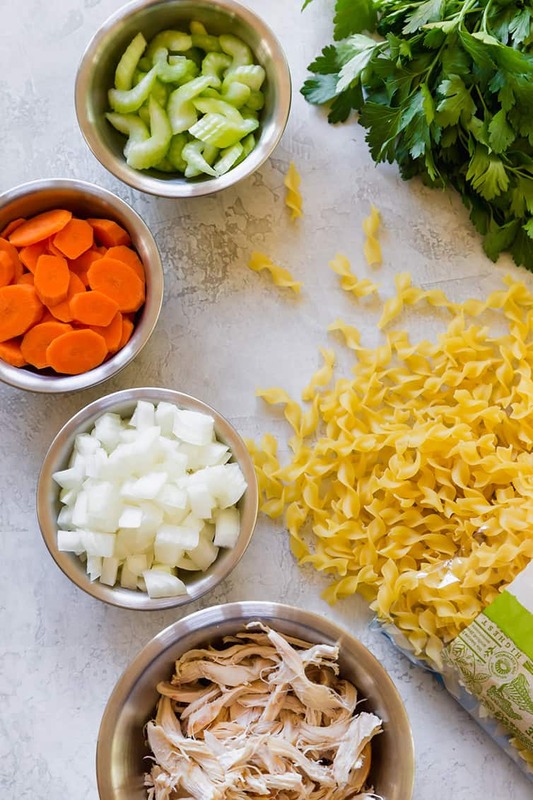 Egg Noodles – These thin, broad noodles are synonymous with chicken noodle soup, but you can substitute any sort of noodle that you’d like. Seasonings – Parsley for a burst of fresh flavor and, of course, salt and pepper for flavor and balance. And that’s it! Who knew such a satisfying meal could be ready so quickly and easily? 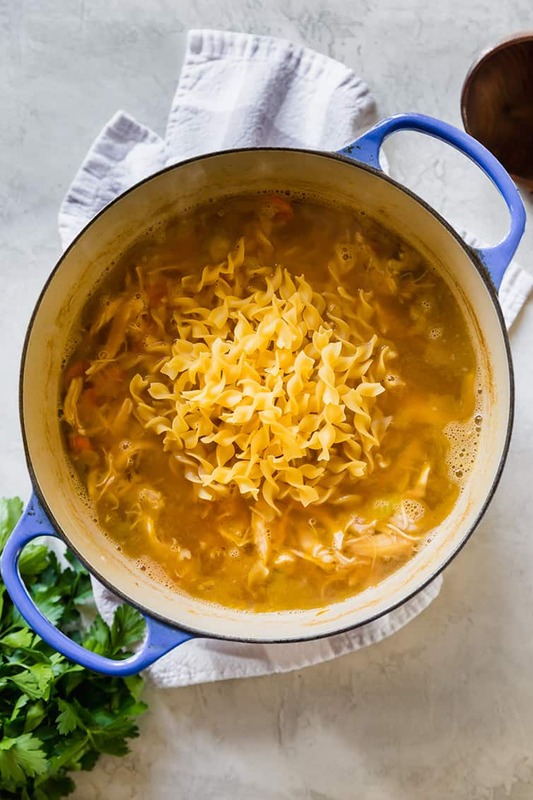 A few quick tips and suggestions for making the best bowl of chicken noodle soup possible! When you chop the onion, celery and carrot, try to make the pieces as uniform as possible so that they cook evenly and you don’t end up with some firm and some mushy. That’s the worst! If you have homemade chicken stock, by all means use it! If not, a really good, organic chicken stock with a small list of ingredients will do wonderfully here. You can cook the chicken meat yourself, or use a store-bought rotisserie chicken instead. Feel free to substitute some or all with dark meat, if you prefer it (I do!). I think egg noodles are best here, but you can use any other type of noodle you prefer. Chicken noodle soup can be frozen in an airtight, freezer-safe container for up to 6 months. Serve with your favorite dinner rolls or crusty ciabatta bread. 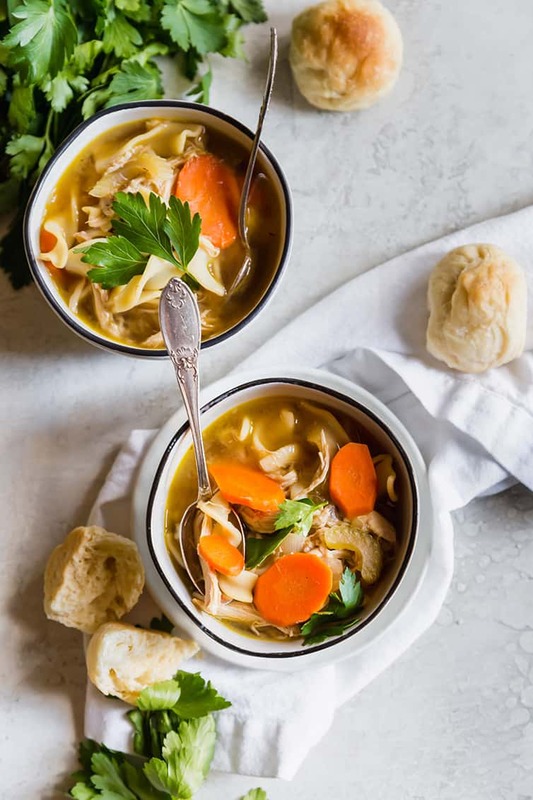 And there you have it… your next bowl of delicious homemade chicken noodle soup is only a few ingredients and 45 minutes away. It could not be any easier; no need to grab a can at the grocery store or takeout a container from your favorite sandwich shop. Grab your favorite blanket, the coziest clothes, and snuggle up with a bowl of this soup. Heat the vegetable oil in a large stockpot or Dutch oven over medium-high heat. Add the onion, carrot and celery and saute until softened, about 5 minutes. Add the chicken stock and shredded chicken meat. Bring the soup to a boil, reduce the heat, and simmer until the vegetables are tender, 10 to 15 minutes. Stir in the noodles and cook until just tender, about 8 minutes. Stir in the parsley and salt and pepper to taste. Serve immediately. Leftovers can be stored in an airtight container in the refrigerator for up to 4 days. When you chop the onion, celery and carrot, try to make the pieces as uniform as possible so that they cook evenly and you don't end up with some firm and some mushy. That's the worst! Update Notes: This recipe was originally published in January 2012. Updated in February 2019 with new photos and extra recipe notes.